I hope you’ve all experienced that sort of awkward and instant connection with another person where you couldn’t hold back a slight smile aimed in their direction. You know, when you were swooning, charmed, and completely taken a back. One of those” you are so beautiful to me,” moments. I’m not sure if that’s real love or a sentiment bordering on lust, but it’s all too rare a feeling, and one that completely overtook my face while watching Disney’s latest animated classic. This is a special film made with finesse, designed with keen observation, told through as respectful a perspective as its populace could hope for. I’ve said before that all good family films are about redefining home. In that regard, Moana is about as moving and masterful a take as you’ll see in 2016. Polynesian islander Moana Waialiki (Auli’i Cravalho) is an evergreen tree of spruced curiosity, forever drawn to the surrounding and unthinkably outstretched waters. “How far does that go?” is part of her babbling baby Lexicon. Traveling beyond the reef is both in her blood and is her calling, and like the horizon, looks unlimited in its distance. But so is being the heir to her father, Chief Tui Waialiki (Temuera Morrison). Their people need her. Coconut crops are dying, fish are scarce, food has practically run dry. Moana’s suggestion to search beyond the reef angers the Chief. However, as the village hippie, Gramma Tala (Rachel House) always makes sure Moana’s soul-seeking fire keeps burning. Moana is a very grounded, landlocked, and terra firma film that eventually blends into an ethereal quest of mythic and legendary proportions. Since her days in a diaper, Moana and other children were told stories by Gramma about the Demigod Maui (Dwayne Johnson), who stole the stone heart from the island goddess Te Fiti and unintentionally unleashed an era of anti-agrarian life upon the islander people. Moana doesn’t volunteer to fix the matter, only because doing so is her ultimate purpose. How and when she chooses to set sail is such a touching, passionate, pivotal moment. Moana wears her heart on her sleeve and is all the better for doing so. Moana starts with the story of Maui in an opening that’s pure exposition. The first minutes are informative, as well as horribly executed and over explanatory. Subtle isn’t the name of the game here. But you can’t necessarily fault an original fable for needing to set up the basics. Maui has served humans his whole life, and by trying too hard, he has unknowingly turned the planet against them. Although he might seem like a big doofus who only wants to regain his phallic symbol of power in a giant hook gifted from the Gods, Maui just longs to be acknowledged and appreciated (his countless tattoos explain this notion, as they only don his skin after a good deed is done). Maui’s hamartia couldn’t be more human…he pines for connectivity. He might be reluctant to agree to such a relationship, but he finds this in the persistent firecracker spark that is Moana. This film only has three weak spots: the mapped open, an over-the-top chase scene à la Mad Max, and too tidy of an ending for a story suffused with so much sacrifice. Each misstep barely lands left or right of center. Maybe that’s because Moana has been so reverent in its telling. Watch some featurettes about the making of this film and you’ll see the time and consideration put into getting this picture just right, as well as Lin-Manuel Miranda’s memorable musical numbers. From properly honoring islanders of the past, showing the present, and imagining the possible future, the film feels timelessly told and broadly effectual. 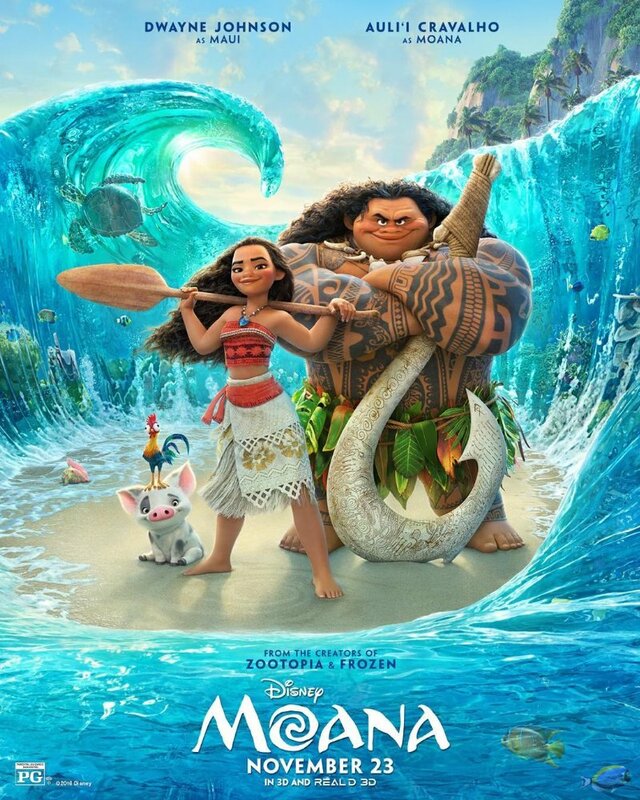 In Moana, the antagonist and the environment are one and the same, and the battle against Mother Nature’s tide or against her winds comment on those who choose to exploit or exhibit her through arrogance or ignorance or rapacity, all to tear her apart. Planet Earth is not battling back against us. Rather, she’s shouting through a megaphone, begging for us to act synergistically and to consider her livelihood entirely because our lives rest in her balance. Such is the grace and the humility of Moana. It’s not enough that we have a strong, determined, calm leading lady as our navigator. And not because she’s a Princess either. But rather because her appeal comes from her warrior spirit and a voyaging, seafaring sense of exploration. Because of this, Moana doesn’t settle for defining home as a singular space. It knows that home is more than a location; it’s a comforting, encompassing, enveloping feeling that begins in the heart and extends outward like a branch. We can’t always help where our roots are planted, but we can always adjust and guide where the vines might reach and grow and decide what structures they wrap themselves around. 2016 has been a year of cynical pessimism. So, like any skeptical teenager in the face of struggle and decision and formal opposition, the movie temporarily wavers before our lead takes hold of the grips, rights the sails, and steers us back towards a remarkably confounding sense of realism for an animated feature. Problems and all, the picture issues us a spare tire to keep driving towards a distant, more hopeful and inclusive future. I selfishly loved this film, and I don’t feel bad about that notion, because Moana takes the time to love us in return through song and through showmanship. Another wonderful movie to add to the Disney classics.The film stars the daughter of a chief who sets of on journey to save her island. She journeys to find Maui, a mischievous block of tattooed muscles, I mean demigod, to help her save the world. They bond, fight, laugh and save the world with the help of the dumbest chicken you have ever met.